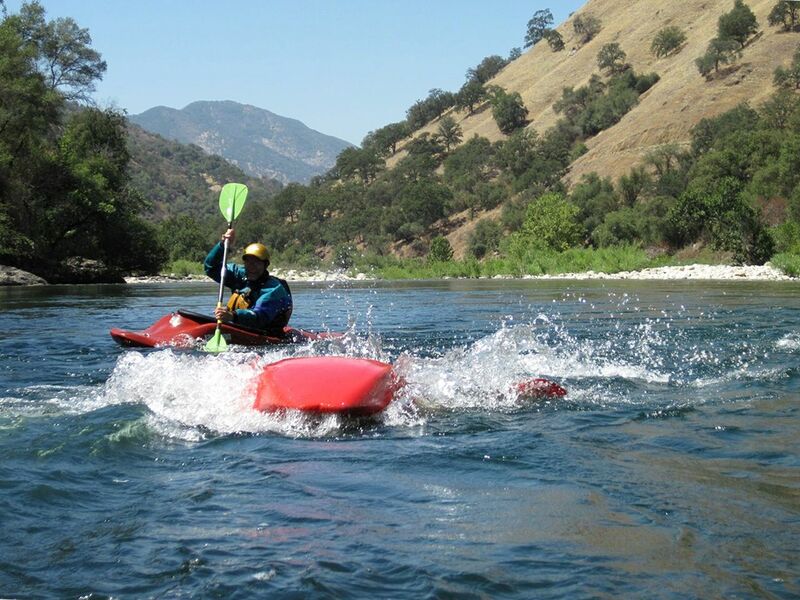 This section of the Kings is great for introducing people to paddle rafting. 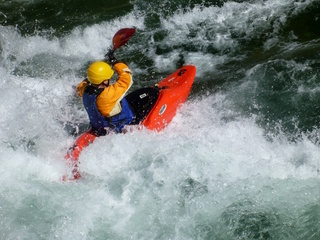 Except for Banzai rapid near the beginning, all rapids are straightforward. 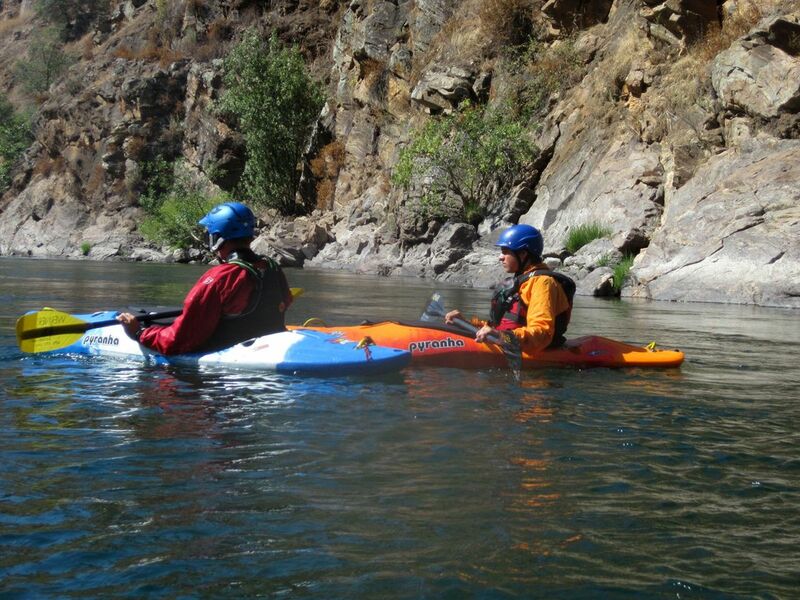 It is easy for guides to get their rafts lined up correctly without paddler assistance, a dicey proposition on some other rivers. The wave trains are long and large, and riverside scenery is excellent. For kayaking, flows often last well into the summer. 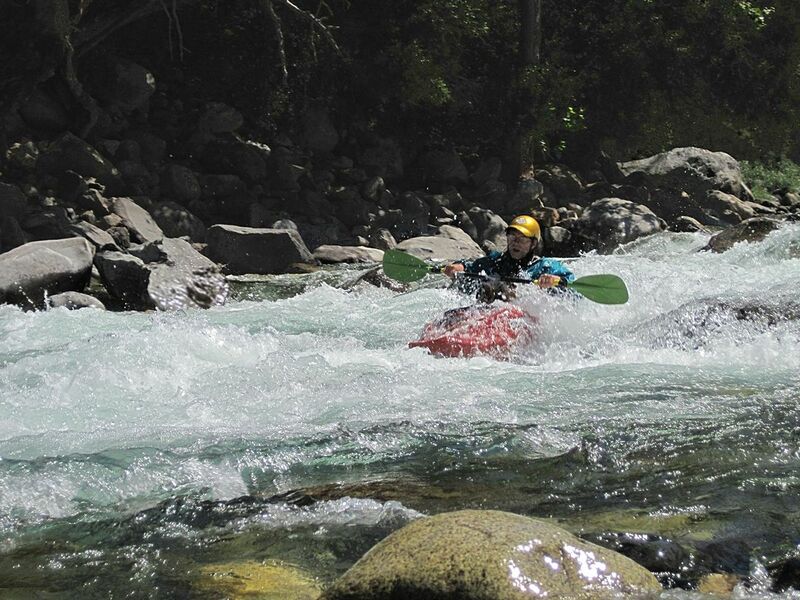 Beginning paddlers usually feel that they are on a tough river. 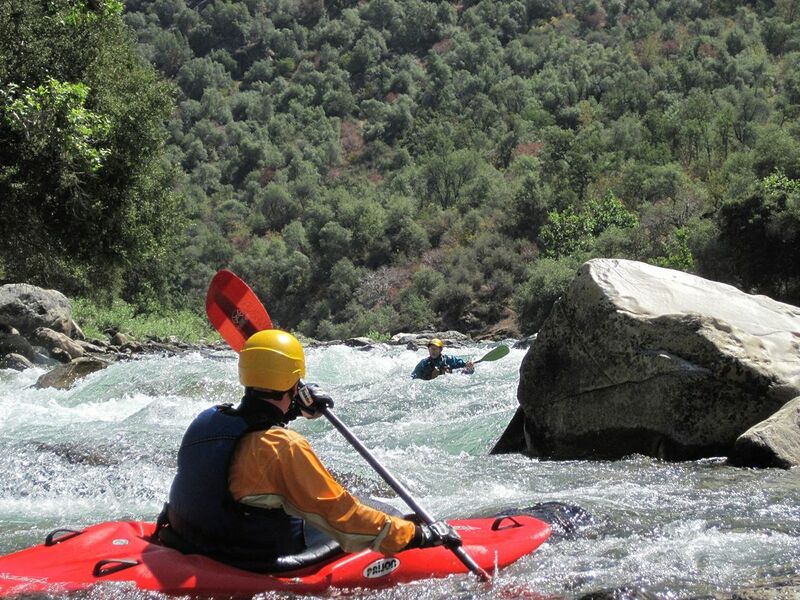 They think that the Kings is harder than the more technical Tuolumne, although guides know that the reverse is true. For kayaks, this may or may not be what you want. Most wave trains will not upset your boat if you are lined up correctly, but you might feel lost in the troughs of waves. 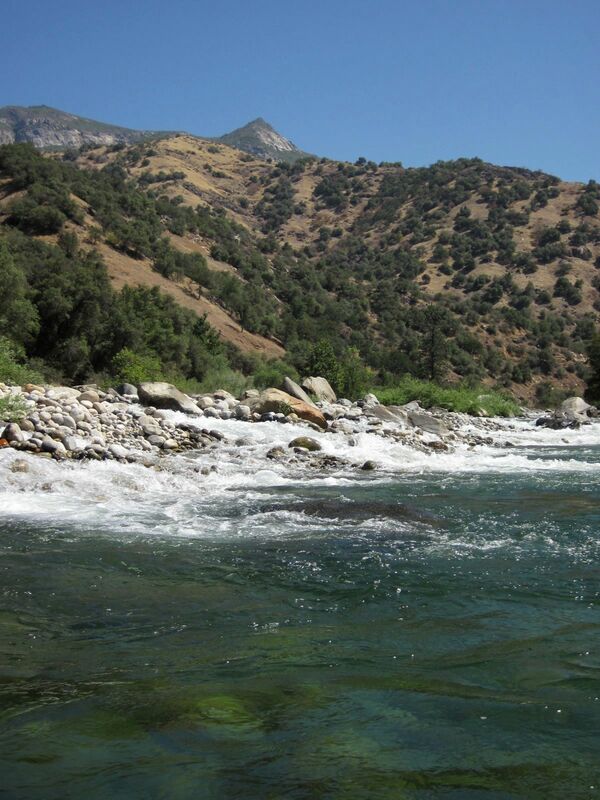 If you do swim, it could be a long and cold experience: the river water was snowmelt only a few hours before. The total river distance is not far, so unless you camp, driving time to the river may exceed floating time. Compounding these drawbacks is the long drive along the shores of Pine Flat reservoir, guaranteed to cause suffering for anyone prone to carsickness. An alternate route is available to reduce distance along reservoir; see shuttle directions below. 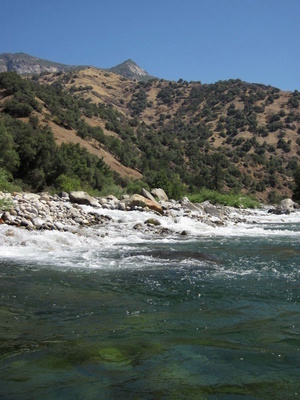 Fortunately once you reach the river, you find many good campsites surrounded by oak forest with occasional vistas of rocky peaks. Before starting, you should scout Banzai from a high cliff on the river bank, accessible from the shuttle road about a quarter mile from the end. If you decide not to run Banzai, put in on the beach just below that cliff. Most of the rapids on this run were named by Fresno area kids on YMCA-sponsored rafting trips, which explains why so many rapids are named after animals! The put-in beach at Garnet Dike is usually crowded with commercial outfitters and private rafters. It might be best to inflate your boats in the shady flats above and carry them down to the river when you are ready to begin. Wild Wolf Chute, a narrow class III against the left wall. Banzai, class III+, a big hole right of center with a wrap rock just below. Thread the needle between a small hole on top left and the huge hole to the right below. Try to avoid flipping, because a swim involves crossing a shallow rock ledge that could bruise your posterior. At high flows, Banzai can be sneaked far left over the gravel bar that blocks the way at low flows. YouTube video of left- and right-side kayak runs at 1200 cfs. Rapids taper off to class II-III for the remainder of the run. Mule Rock, class III-, where current flows into a midstream rock, is not significantly harder than anything else. Fang Tooth, class III-, a long boulder garden, is easier to maneuver in an inflatable kayak than in a raft, and is not significantly harder than anything else. Mill Flat Creek enters on the left. A long dirt road starts here leading to the big trees of Sequoia National Park. Rickety bridge of Rodgers Crossing. 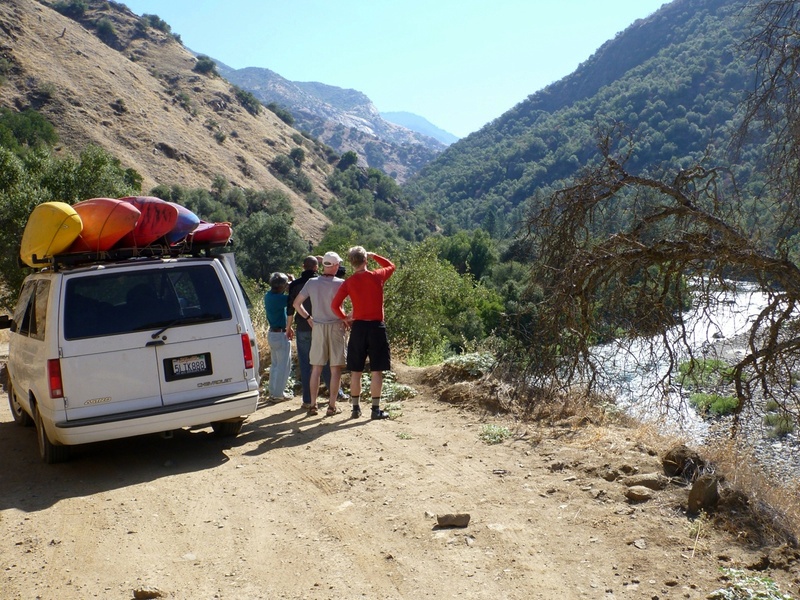 On the north bank, a paved road turns left, heading to wilderness areas up the North Fork. The dirt shuttle road turns right there. 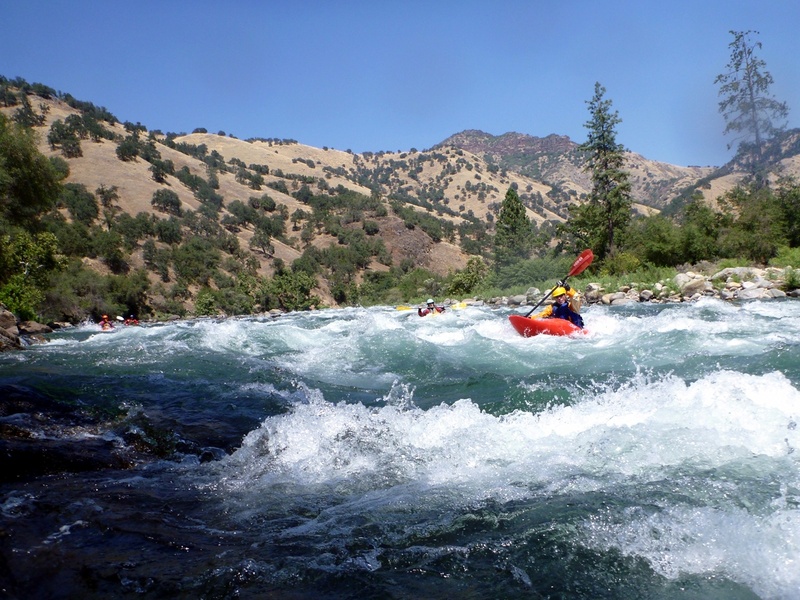 North Fork of the Kings enters on the right, and makes a good paddling excursion for a short distance upstream. Sidewinder, class III, longer and steeper than the aforementioned class III- rapids. 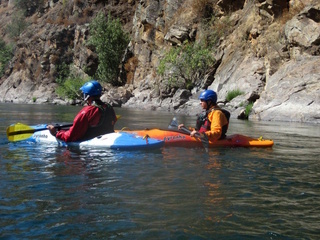 This rapid is nothing like a snake; perhaps the YMCA kids spotted a rattlesnake along the river while scouting. 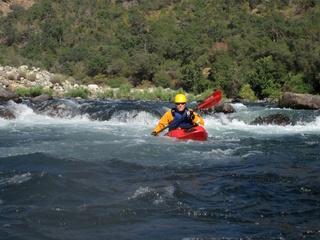 Sidewinder doesn't really end until the island that splits the river above Rooster Tail rapid. Besides Banzai, this is the biggest rapid on this stretch of river. The big action starts left of the island, and continues for quite a ways. There are several very large waves where the right channel joins back in, a good spot for photography. Concrete bridge across the river. 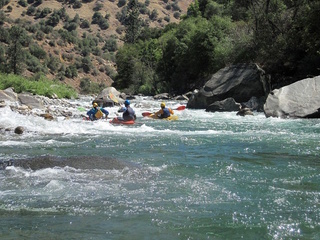 Class II-III rapids continue. Kirch Flat campground and take-out on the right. Slack water of Pine Flat reservoir is not too far downstream, so if you lose your boat in a rapid, you know where it will be. To reach take-out, drive east from highway 99 onto highway 180 in Fresno. After 18 miles you reach Centerville; turn left on Trimmer Springs Road. Continue past Piedra, and wind 30 slow miles around the north side of Pine Flat Reservoir. Kirch Flat Campground is shortly upstream of the point where you reach the river, and Rodgers Crossing is further upstream. If you are coming from the north, an alternate route is available. According to Google Maps, driving time is longer, but that is dubious, because traffic lights are fewer and distance is 7 miles shorter. From highway 99, take exit 142 onto Herndon Avenue east. Continue just over 12 miles to Clovis, where you merge onto highway 168 east. After 12.1 miles turn right onto Sample Road. After 3 miles turn right onto Pittman Hill Road. After 1.2 mile take the first left onto Watts Valley Road, which in 7.4 miles becomes Maxon Road. Continue another 5 miles and turn left on Trimmer Springs Road. After about 18 miles you reach camping areas near Rodgers Crossing. To reach put-in, continue upriver, possibly cross a concrete bridge, and continue on the paved road to Rodgers Crossing bridge. (A dirt road bears right on the south bank leading to Mill Flat Creek and other campgrounds.) After crossing the bridge, turn right onto a dirt road and drive 7 increasingly slow miles until you reach Garnet Dike put-in. Stop to scout Banzai if you are considering putting in above it. To find nearby food and lodging, type Fresno into the box and click Search.